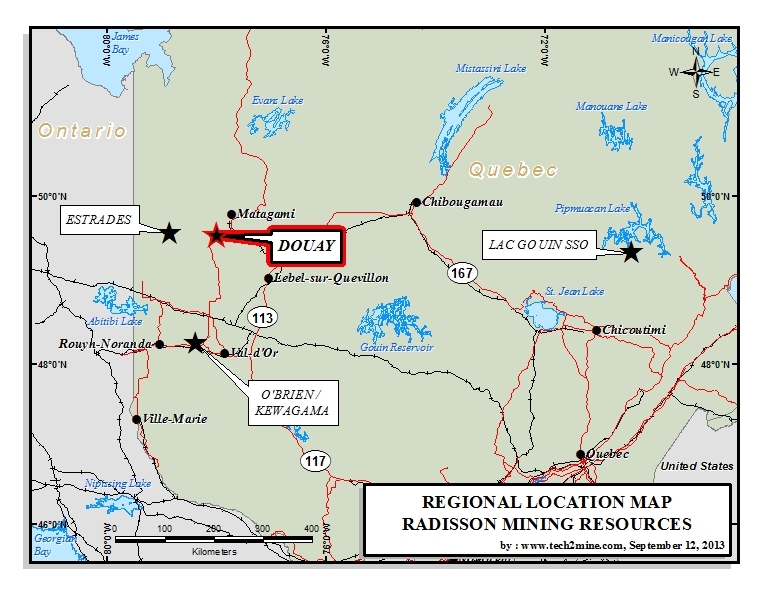 Radisson’s Douay property is located in the province of Québec, in Douay and Vezza townships. It lies about 35 km southwest of the town of Matagami. Provincial highway 109 (paved) connecting Amos to Matagami is about 10 kilometres north and west of the property. The Company has a 100% interest in the property, which consists of 36 mining claims covering 1,426.93 hectares. 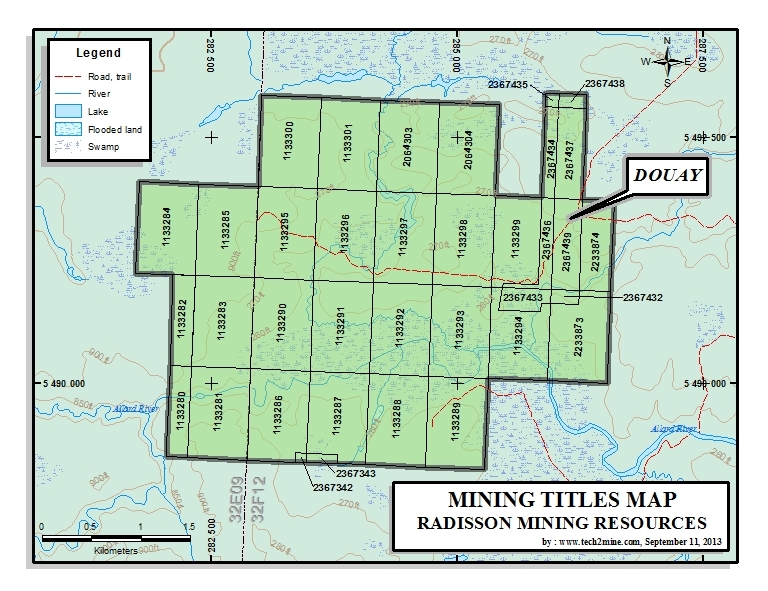 The only exploration work reported before the property’s acquisition by Radisson dates from 1982 and was done by Canadian Nickel Company Limited. The latter completed magnetic and electromagnetic surveys and three diamond drill holes. Radisson acquired the claim group in late 1984. The property is located in the north central part of the Abitibi Greenstone Belt, a subdivision of the Superior Province. The rocks are Archean in age except for a suite of diabase dykes, which is Proterozoic. Metamorphism is generally to the greenschist facies except near major intrusions, where it reaches the amphibolite facies. Structurally, the area is cut by the Casa Bérardi-Douay-Cameron deformation zone, identified over more than 150 km. This regional structure is formed of a roughly east-west network of anastomosing shear zones, mainly along lithological contacts. Several major gold deposits in the region, such as the Vezza, Douay West, Casa Bérardi and Detour deposits, are spatially associated with this deformation zones and with the southern regional contact between Taïbi Group sediments and Cartwright basaltic volcanics. The Vezza gold deposit, which is located about 13 km east of Radisson’s property, lies within the Vezza Fault zone (Gauthier et al. 1997). This deposit is located near or at the faulted contact between sedimentary rocks and mafic volcanic flows, both belonging to the Taïbi sedimentary domain. On December 31, 2012, the Vezza deposit contained a measured and indicated resource of 1.2 million tonnes grading 6.5 g/t Au (4.2 g/t cut-off) and an inferred resource of 436 million tonnes at a grade of 4.9 g/t Au (3.0 g/t cut-off) (Reference: Updated Mineral Resources, Vezza Property, 43-101 Geopointcom, Dec. 2012). Aurvista Gold’s Douay gold deposit is located approximately 6 km west of Radisson’s property. 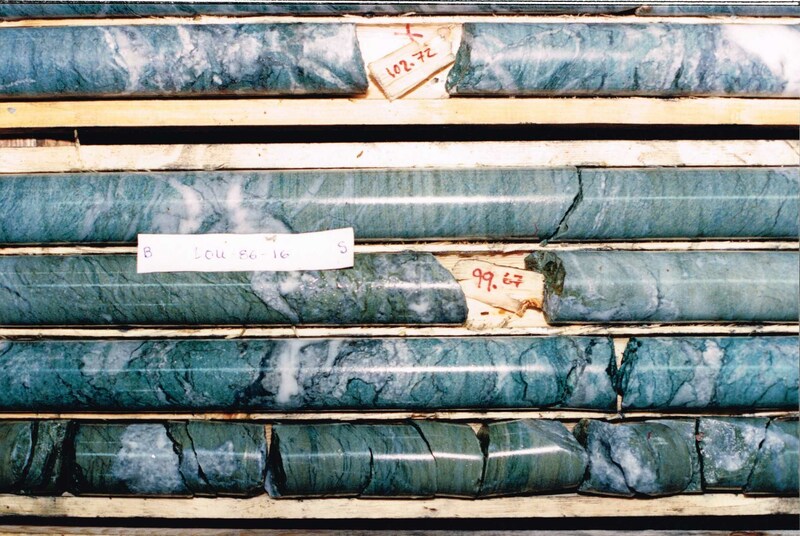 This deposit, closely associated with the Douay Fault, contains (for an open pit scenario) an indicated resource of 2.7 million tonnes at an average grade of 2.76 g/t Au (0.3 g/t Au cut-off) and an inferred resource of 115 million tonnes at an average grade of 0.75 g/t Au (0.3 g/t Au cut-off) (Reference: 43-101 Technical Report, Riverbend Geological Services, August 2012). Radisson’s property is located in the Harricana-Turgeon volcano-sedimentary belt, more specifically along the Casa Bérardi-Douay-Cameron gold corridor. The main lithological units include an assemblage of mafic to felsic lavas and sedimentary rocks of the Taïbi Group. The stratigraphy is oriented roughly east-west and characterized by steep dips to the south. The Company’s work led to the discovery of two major deformation zones, corresponding to the Douay Fault and the Harricana Fault. These two major shear and hydrothermal alteration zones cross the property in a roughly east-west direction. The Douay Fault, to the north, is the extension of the structure containing the Aurvista deposit, 6km to the west. The Douay Fault lies north of the Harricana Fault and its eastern extremity merges with it. The Douay Fault’s western extension also merges with the Casa Bérardi Fault. The Harricana Fault, which crosses the southern portion of Radisson’s property, is a major regional structural feature. In 1985 and 1986, Radisson conducted ground geophysical surveys (magnetic, horizontal loop electromagnetic (HEM), resistivity and induced polarization surveys) and drilled 36 holes totalling 10,209 metres. In early 1987, Radisson had complementary induced polarization and magnetic surveys carried out. Since that time, no further exploration work has been done on the property. The drilling identified two major fault zones: the Douay deformation zone and the Harricana deformation zone. The Douay deformation zone forms a tectonic corridor 100 to 300 metres wide marked by the presence of graphitic and cherty horizons, and strong sericite and carbonate alteration. The Harricana Fault, 700 metres further south, was intersected over a width of nearly 200 metres and consists of altered and sheared ultramafic rocks, specifically chlorite-talc-dolomite schists, and occasionally green carbonate breccias (fuchsite) reminiscent of the Cadillac-Larder Lake Break and Porcupine-Destor Fault. Interesting gold intersections and two anomalous gold bands were obtained along these two major deformation structures in zones with strong hydrothermal alteration. Hole DO-86-16 brought to light a significant gold intersection grading 5.82 g/t Au over 2.35 metres (including 13.71 g/t over 0.91 metre) in the Harricana Fault zone. The gold discovery is in the central portion of the property. It occurs in a strongly silicified tuff, which was also identified in hole DO-86-19 at greater depth. Pyrite is the dominant sulphide associated with the alteration, generally with 1% to 5% finely disseminated sulphides (locally 15%). In the area of the Douay Fault, the work revealed a gold zone with grades reaching 5.49 g/t Au over 0.59 metres. In addition, the drilling intersected two strongly altered shear zones and a pyritic chert horizon along the Douay Fault. Bands mineralized with fine needles of arsenopyrite were also intersected at various levels in several drill holes and were associated with zones of intense tectonism and alteration. There has been little drilling of the extensions of these mineralized zones and they have not been verified at depth. The association of gold values with the two major faults and the presence of several still untested geophysical targets are good indicators of the property’s potential. All scientific and technical data discussed in this document has been prepared by or under the supervision of Yolande Bisson, Eng. MBA,consultant, who acts as a Qualified Person for the Company, as defined by NI 43-101.